Which axe should Franken'Punker rock out to? 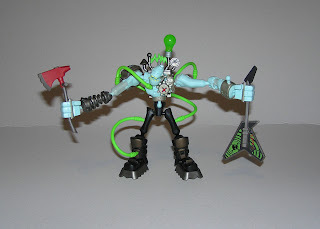 He has a tough time figuring out which one plays music, and which one makes blood squirt. 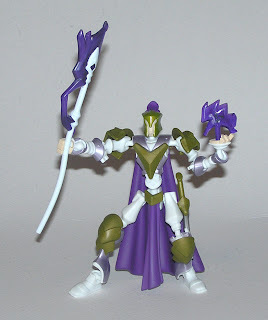 This guy is another top five Xevoz toy, although I better watch out how I say that or their all in the top five. 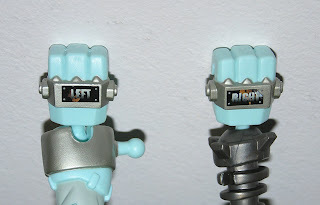 Sadly, Franken'Punker isn't the only one who can't tell left and right. I was trying to use extreme brain power while applying his left and right hand identity stickers. Right after I applied right, I realized that was left, and had to reapply. Now right has a little bit of wear to it. Should have just left it how it was, it is Franken'Punker we are talking about here. Xevoz - FireDrake - Where's the fire? Brave Knight: "Slay that dragon you say? The one with the armor that is larger than mine?!!" I'm a little disappointed with the Xevoz Reptosaur FireDrake. If a dragon is what they were going for, I think it could have been way cooler compared to how they hit the nail with all the other kinds of forms. Its head and neck being a little awkward to work with is its first flaw. The second are its wittle wings. They are not impressive for a dragon's usual main feature. The armor is cool though, and that anvil begs to drop on many a Xevoz head. I would still skip it, for some of the others still. Unless I was collecting all the Xevoz, then I would want it in the collection. Not that I'm trying to collect them all. Who does that anyways? Xevoz - Crypt Curse - Toilet paper? The Mummy Xevoz has to be in the top five of figures. It is almost two for one value, with a great Anubis dog warrior look or standard mummy look. It also has an action feature; torso spinning which mummies often do in the real world. I was lucky to find him in a giant lot of Xevoz I recently acquired on Ebay. Two large shoe boxes full of parts arrived at my door. It took about three hours sorting the pieces out, and rebuilding the toys. It was like uncovering a real mummy. I like making the Anubis head beg for the chicken leg piece from the mummy. 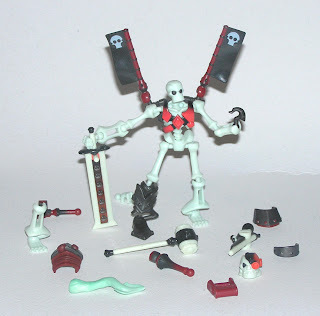 Skull Jack made the cut for my first Xevoz figure to buy, way back in the day. I figured if I didn't want to continue to collect, at least I would have a neat core skeleton to use as a boiled GI Joe or something. Hey remember this flash back post Skeleton Run? Those were the days. Say, isn't the Summer Toy Olympics coming up? Went to Portland this past weekend. Lots of family visits, expensive refueling, and driving. 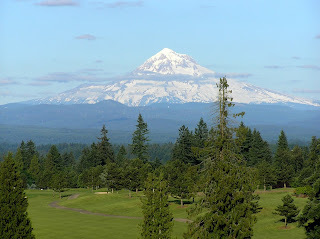 Did get some neat pictures of Mount Hood at a Country Club for a wedding reception. 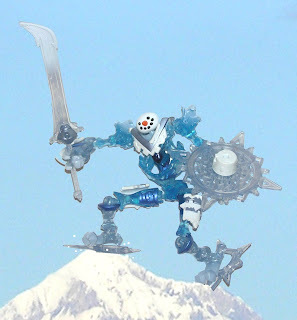 More Unbelievable was when I zoomed close to the peak and found Xevoz Cryo Katan climbing the mountain! He must use some sort of pixelazation dampner because he looks pretty clean, and the mountain fuzzy. Xevoz - Rune Slayer - Nice Shoes? All my life I wanted to be an Arcaster; a powerful order of magic wielding warriors! I practiced hard, allied myself with a Hyperfury, and eventually graduated top of my class. I became a Rune Slayer; master of runes, lore and incantations! Few of anything can match me in battle. I travel far in quest of ancient texts, tomes, and artifacts. Also pretty good at casting powerful spells and conjuring weapons of magical might! Then I saw the shoes I was required to wear. So I retired. 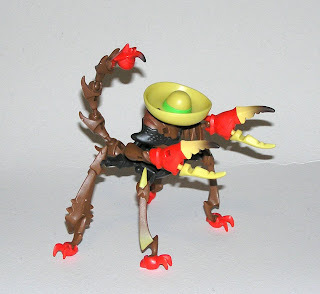 Xevoz - Dune Stinger - Nice Hat! 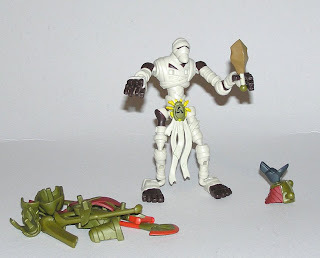 The Xevoz Sectoid figures are simply the best insect toys ever made (sorry Insecticon). With plentiful joints and pieces, these things look pretty scary! They seem to carry extra parts and pieces on them as well! Its nice to have that kind of variety in a toy line. Some Xevoz will stand a few inches taller than others, some will be more massive than others, some will come with a sombrero. 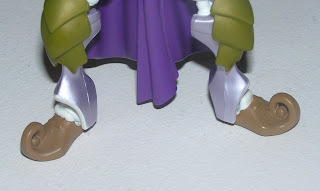 That makes another genius factor for Xevoz; most figures come with a humorific piece. 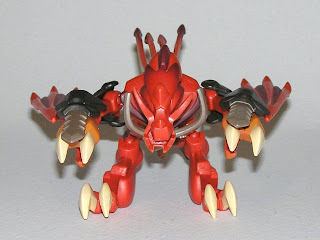 Xevoz - Razorclaw - how cute! 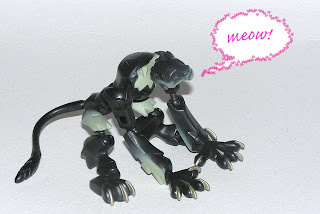 At the core of every Xevoz figure is a cute and cuddly kitten, puppy, human, element and or skeleton. Take for instance soft little Razorclaw here. Actually, he prefers the name Softy Paws. 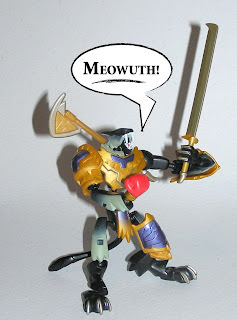 Lukily with the assortment of Xevoz armor and weapons, we can outfit little Softy Paws into a mighty warrior! 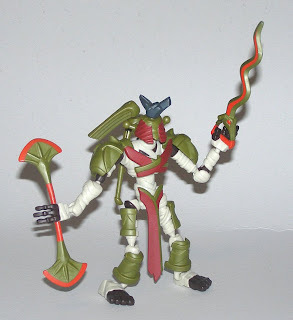 One of the best toy lines never talked about is Xevoz from Hasbro. I bought a few right when they came out around 2003ish, but my old roommate bought more, so I played with his. 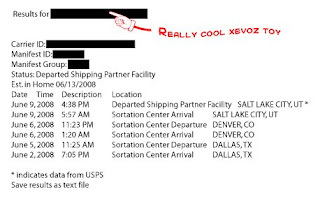 But when he moved out, so did the Xevoz. I still kept my favorite Robot on my desk at work (not pictured), and over the last few months it convinced me to start searching for more. Unfortunately the toy line is long gone, and its kind of tricky to find them. Entertainment Earth has some of the last wave left, which is great, but they are not the crown jewels of wave 2 and 3 that are impossible to find. 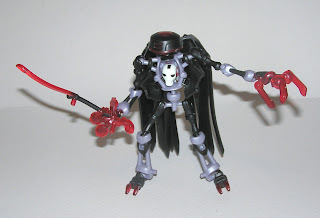 Xevoz are a cousin of Stikfas on speed I like to say. 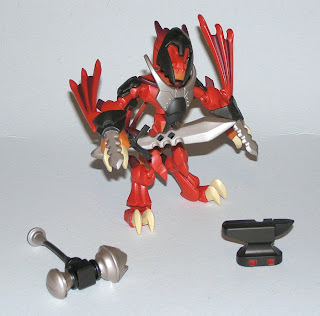 You build them out of small parts and pieces, you can mix and match with other Xevoz figures, and they form a game that's sort of lackluster at best. They come with lots of customizable character and are easily displayed. They are perfect for stop motion filming, because they balance really well. I will have to try that some time. The one pictured today is Infil-Traitor of the Biomechas. 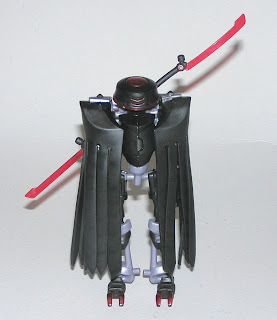 A dark cyborg ninja with a head in the center of his chest, comes with an awesome fluttering cape, powerfull crasping claw hands, and a strange trash can head. Garage sale find of the year! Amazing how all the little pieces of life sometimes build incredible destiny. Every year a coworker reminds us that a neat neighborhood garage sale is coming. It always sounded fun to go, but alas, I sleep in on Saturdays until about 4PM, missing the event. But this year an annoying problem resulted in me being awake to go. For the last couple nights our internet cable has been doing strange things. Mostly not working in the day time, not providing any good Ebay sales, and stopping to work when it looked like it was finally starting to work. I was real worried we burned through another modem like we did back in January. So I calls Cable One I calls, and they find that it is some problem on their end for a change. At first they did try to peg it on me, but then they realized their stupid ways. Someone had incorrectly added a new neighbor's cable line to splice off of ours, thus in the day time when they used it we couldn't use it. Then at night when they stopped, it started working again. Anyhow Carlos fixed the problem right away thankfully and the cable was again working around 10AM on a Saturday morning. So, a perfect opportunity to head to the Garage sales at Lakewood. Now that I'm writing this, I'm sad, for I just realized I forgot something! The first house we went to had an opened original Red Ranger!!! I was going to go back for that! I have one still in the box, this way I would never have that urge to tear it open. Drat! We went to several houses, but found the usual wooden fruit trays, ribbon candy bowls, and tie try spinners. Finally though I found a house that had some toys! 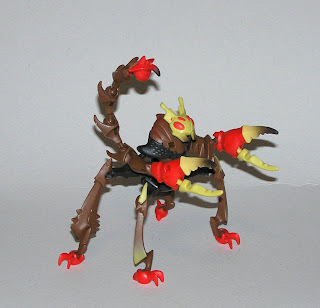 They had some Megablock dragons and some Lego Bionicles, but I had enough of that addiction already for the year. Then I saw it...the most beautiful thing ever. 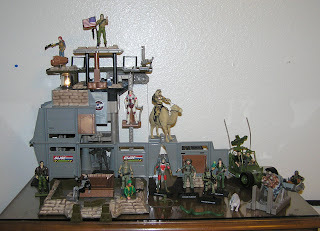 The grand GI Joe base I had been looking for my entire life. It was keep in pretty good shape for a Garage sale too. A few missing pieces yes, but nothing broken, or horribly drooled on! The main kicker is that the light bulb search light still works, and a bunch of sound effects! It has panels that if you hit, things go spring loaded flying. The best being the main tower collapses and makes explosion sounds. It also has a neat jail cell that if hit, the occupant can escape out a hatch. It folds up nicely, came with most of its original weapons, and even a couple Cobra BATs! I got a good deal for it too, talked it down to ten dollars, (actually the owner said she wanted to sell for 15, but thought 10 was better, I just said thats fine, because I was too excited). She then asked if it was for someone or for me. I just said "Uh, yeah... its for someone else." as I shifted my eyes back and forth. So thats my new GI Joe base headquarters story. It happened like I dreaded it would happen. All my current toy orders all decided to show up on the same day. 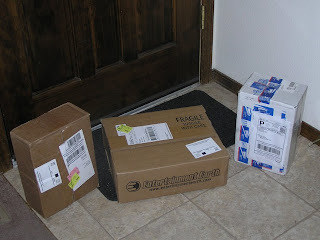 It was almost embarrassing as Gary the mailman (not his real name), came to the door with three packages saying, "It must be Christmas." All of a sudden I had this buyers remorse feeling on why did I buy so much. Had the orders come in a timely manor, I would have been able to have some evening fun every few nights. So I opened a couple Friday night, some Saturday morning, and I'll save some more for Sunday, but it feels strange to limit myself on my own terms. What still gets me is that white postal box on the right was ordered Tuesday, and took only a few days to arrive, while the Entertainment Earth package was ordered almost two full weeks ago. The Tracking info was like they intended to sit on it on purpose. Just to simulate how I felt waiting for these toys, I will wait a post before showing a picture of what I ordered. These super cool toys may appear to be on the low end of the price spectrum, but they are actually worth somewhere up to nearly thirty thousand dollars! 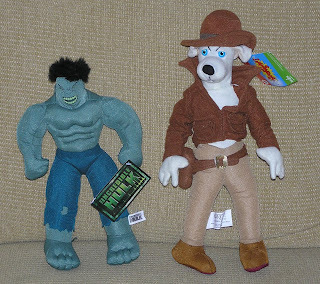 When I go to the store during lunch time, a couple times a week, I like to play a few rounds of The Claw Machine. For months and months now I came out empty handed. But through determination, intelligance, and learning how to spell intelligence, I learneded a few tricks to a successful claw grab. Those secrets will never be shared! Just kidding. I find that the claw will never really grab on to a toy like you think it would. It may appear to wrap its clawlings all over the toy, but in 99% of attempts the claw just slips away. I'm betting there is no grip at all on that claw, the claw is limp. SO, the trick being is find a toy on top of the other toys firstly. This way its not jammed in and never able to pull out. Look for a toy with a small tennis ball sized area to grab on to toward the end of the grab. My best successes was where once the claw slipped the main grip of the bulk of the toy, the remaining area where the three prongs come together has the support structure to snag that tennis ball area and lift the toy up and out. As you can see in Indiana Dog Jones (is that Krypto?) the three claw prongs came together under his hat and then was an easy lift out. The Hulk was trickier, actually getting the three prongs to support under the arm. As for once the toy is in the air dangling so horrifically, it helps to yell out obscenities so that the claw knows you will break the damn joy stick, smash the glass open with a near by candy dispenser, bear hug grab all the toys, and jump into a quick get-away-car. This post is dedicated the super cool SpongeBob Square pants with inner-tube that I failed to get even though the claws had perfectly grabbed the sponge, pronging trough the innertube perfectly. I was devastated. I Ordered on Sunday night 6/1/08. I figured they would ship out Monday night, Tuesday it would travel from origin to destination, Wednesday arrive and get sorted, Thursday get to local postman and deliver. Ok, maybe that's miracle shipping, so Friday. So I find that I have tracking info offered. That would have been nice to know during Friday's after work tantrum. What shocked me is where in the world is Carmen Sandiago? ...I mean, where in the world is my package going? I figure one hub city is enough, like Dallas to Salt Lake City to Boise. Why would it go Dallas to Denver to Salt Lake City. Why not just go to Dallas to New York to Orlando to Seattle to Chicago to Phoenix to Denver to Salt Lake City to Boise? That would be easier. I just noticed the 6/13/08 part. I cannot wait that long!!! I figure, the ebay auction I won for something entirely different will arrive before the other order even ever gets here. Or worse, all three packages of different orders will all arrive on the same darn day thus ruining new package for me everyday for three days event. So what is in the package? I'll let the speculation begin. 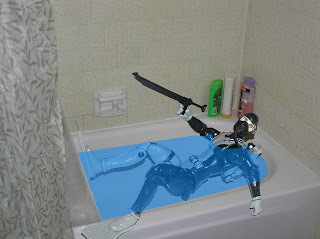 I did not think this GI Joe would spend so much time in the bath tub. I should have left him in the package, and opened Snow Job. 1.) The older I get, the dumber I get. I can't remember how to re-transform them after they have been on a shelf for too long. 3.) I need money for my re-Xevoz addiction. More on this later. 4.) Did I mention I forgot how to Transform them. Frustrating! 5.) Just need to lean up my Toy Museum closets for better and newer things. 6.) Giving YOU, the lifelong fan of the Toy Museum a chance to own original Toy Museum crap ..er toys! 7.) Or better yet, a chance to find my contact info and hunt me down and kill me for sport, you crazy stalkers! So here is the fun filled link;Transformers Only a few days left!